Navigation: Home » Economics » How Many Accredited Investors Are There in America? How Many Accredited Investors Are There in America? 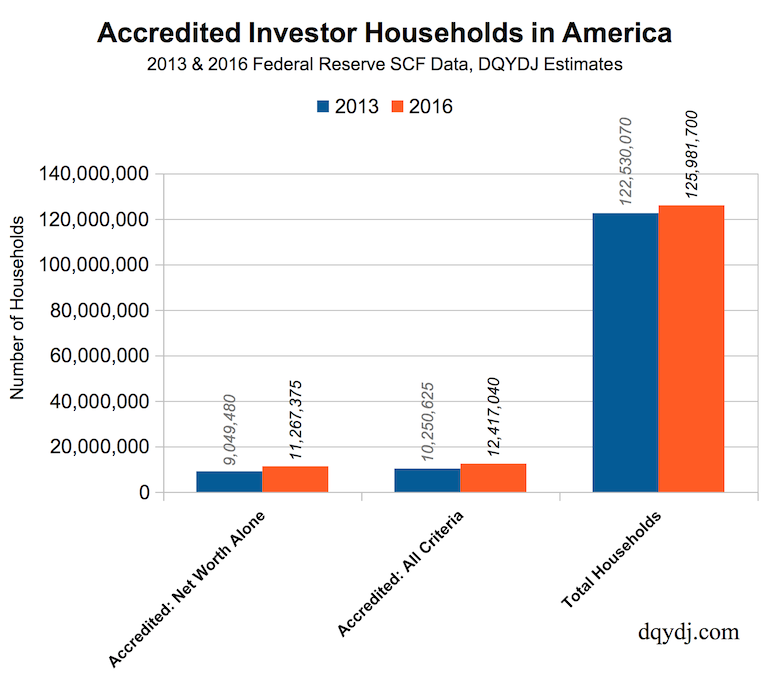 We estimate in 2016 there were 12,417,040 Accredited Investor households in America, 9.86% of all American Households. Further, we calculate Accredited Investor households controlled roughly $65.88 Trillion in wealth in 2016 or 75.8% of all United States private net worth. While being an accredited investor doesn’t guarantee access to private deals, it’s a necessary condition. For investments as varied as angel investments, venture capital, private equity funds, hedge funds, and other private placements an investor will first need to qualify as accredited. What is the United States Individual Accredited Investor Criteria? (or) One household member earning $200,000 the last two straight years and expecting it to continue in the current year. (or) With a spouse, earning $300,000 the last two straight years and expecting it to continue in the current year. Note that the original law specifically calls out net worth for the classification. Also note: households have to maintain the criteria in subsequent years to keep their accreditation. We estimate that the net worth qualification is the most common way to achieve accreditation. 11,267,375 households qualified on net worth alone. (See our post on millionaires in America). There are roughly 2.82% more total households in America from the 2016 data over the 2013 data. The number of new households achieving accreditation was very high. We estimate there were 2,166,415 more accredited households than 2013, increasing from 10,250,625 to 12,417,040. There were roughly another 2,217,895 households qualifying on net worth alone. That measure went from roughly 9,049,480 to 11,267,375 households. What Are Some Accredited Investor Benefits? The SEC normally requires that companies and private funds register security offerings with the SEC and make specific disclosures. Once an investor qualifies as an Accredited Investor, that investor can invest in private placements which don’t have (as much) SEC scrutiny. These companies and investments often have more potential for great gains… albeit with more risk and the fewer disclosures required by law. Investments include things such as venture capital funds, angel investments, hedge funds, franchises, and other private investments and placements. Of particular interest to our readers, this also includes many forms and styles of private real estate funds and deals. However, reaching Accredited Investor status is necessary but not sufficient to invest in some of these funds and deals. Although laws have changed to allow some forms of marketing, funds and consortiums usually maintain their own investment criteria. This usually includes a combination of a minimum investment and other more onerous criteria, such as a varying definition of ‘liquid wealth’. Even some smaller ‘lite’ offerings can require minimum investments of a few hundred thousand dollars. And of course, there are caveats to these deals. Early in the game there are greater potential gains but investment information is murkier. You must do your own due diligence with any private investments. You should have a harsher screen than with your public investments. If in doubt, stick with index funds – having accredited investor status doesn’t mean you need to utilize it. Note that non-accredited investors have limited access to private deals due to SEC Guidance. You can read more here. All data for this post is estimated from the Federal Reserve SCF microdata. If you’ve seen our net worth brackets in America post you know our general criteria for net worth, but following are the specifics. Although the methodology has improved over the 2013 article, there’s some uncertainty around the “$200,000 per individual criteria”. Specifically, if a household’s “other” earner made more in the past it’s possible using normal household income will screen too many households out. Also, some forms of income such as capital gains, dividends, and pensions might push more households into accreditation. The numbers here only including active sources of income (even with passive forms, net worth accreditation still would dominate). Here is the SCF codebook for more if you’d like to take a crack at improving our algorithm. Just knowing who qualifies as an accredited investor really doesn’t tell you everything. As we implied above, being an accredited investor doesn’t mean you should immediately seek out private investment placements. It merely means that a 1933 law judged some level of assets and/or income to be sufficient to “lose some of it”. Relatedly, not all accredited American households are actually utilizing their special investor status. Also as we said, accredited status doesn’t always mean a person can invest. Sometimes the supply just isn’t there for the investments that people would like to buy into. As soon as some criteria is breached the universe of private investments doesn’t open immediately. You’ll need to find opportunities, talk your way in, and probably clear other asset or income hurdles. And, finally – just because an investment is hard to buy into doesn’t mean it’s a good investment. Stories abound with athletes, musicians, lottery winners and other high net worth individuals who lose it all in private investments. When in doubt, do as we suggested above – stick with an index fund.